Extra news: See you at the RAIA conference! See you at the RAIA conference! 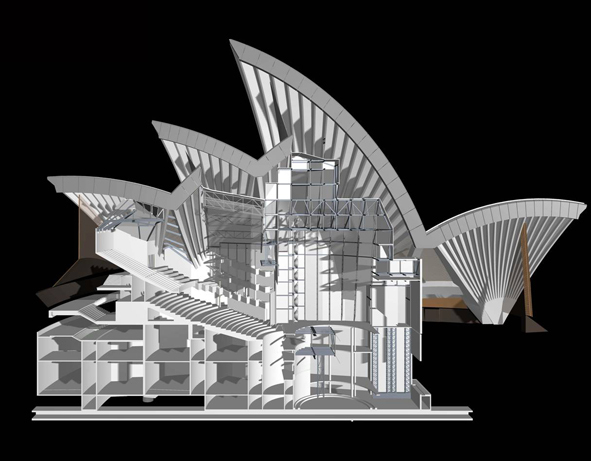 A 3-D CAD example of the visual component of digital modelling at Sydney Opera House, presented as a side elevation. Courtesy Arup & Johnson Pilton Walker JPW. Copyright Sydney Opera House. Construction Innovationis proud to be a sponsor of the 2007 National Architecture Conference, to be held in Melbourne 19-22 April. CEO Professor Keith Hampson will introduce a session in the Towards Integrated Practice Stream about the Sydney Opera House FM Exemplar Project on Friday 20 April. Other Construction Innovation presenters include Joyce Law (Brisbane City Council), John Oliver (Rider Hunt), Paul Akhurst (Sydney Opera House),Stuart Bull (Arup), David Marchant (Woods Bagot) and Kevin McDonald (CSIRO). A new specialist report focusing on the application of digital modelling technology to the Sydney Opera House to create an integrated database capable of high level facilities management functions will be available free of charge to session participants. Also being launched at the conference is a new accredited e-learning BIM module, developed by Construction Innovation and the RAIA, which will be available online via the RAIA website. Building information modeling (BIM) is the generic term for the electronic representation of a building and everything about it, from initial site-condition studies and schematic designs through design-development decision making, specifications and detail documentation, working drawings, as-builts, move-in and maintenance procedures, and performance records. With cross-platform software, the BIM database can be readily used at any time by the architect, owner, engineers, fabricators, and constructors. And the database tracks the contributions and decision approvals of each.